Our new collection is online now! Our online shop will be back online in a few days. We are shooting some really cool & new Fckng Serious designs. Stay tuned! and be serious! The Europe Bus Tour is over! Now it´s time to re-open our online shop, with some really cool products. Check it out! "Who said bus tours are for rock stars only hasn't met the FCKNG SERIOUS gang! After literally proving their street cred during an extremely successful first bus tour through Germany, Austria, Hungary and the Czech Republic in 2017 the team around Boris Brejcha is soon off to hit the road again. This time it's going to be France, Spain and Switzerland with 7 stops in only 10 days. Expect the gang to turn Marseille, Paris, Barcelona among many other cities upside down when the black FCKNG SERIOUS family bus rolls up. Fckng Serious is back on the road. Coming up with a new single EP from Boris Brejcha. The official release date is August the 17th. But you can pre-order it now! You were part of the "FS Europa Bus Tour 2017" and would like to have a little memory? From today, we sell the last pieces of our "FS Europe Bus Tour" shirts. We also have some black logo shirts for you. The "FS Europe Bus Tour" Aftermovie is online now! A dream has come true for all of us! 10 Shows in 12 days, traveling by Bus through Europe. This was such an amazing time! You can watch the full Aftermovie on our Youtube Channel. First of all, I wish everyone a merry Christmas and a nice time with your loved ones. 2017 was such a good year for me and my label. I played so many nice Shows and with my label "Fckng Serious", we were the first electronic music label doing a Europe Bus tour. Thanks again for your support all the time. Stay serious and enjoy my this year's Christmas Mix Number 06. In a time when DJs compete with each other on the size of their private jets and try to beat their jetset lifestyle, the guys and girls of FCKNG SERIOUS go a completely different way. An absolute oldschool and a little Rock'n'Roll attitude spills the idea of the “FCKNG SERIOUS Bus-Tour”. 4 artists, 10 shows in 12 days and well over 100 hours of Techno experience. On the road with a tour bus through Germany, Austria, Switzerland, Hungary and the Czech Republic, Boris Brejcha, Ann Clue, Deniz Bul and Theydream mimic the big rock stars and follow in their footsteps. A unique tour concept for the Techno scene, which can bring fresh wind into the entire culture. We are proud to present that Deniz Bul´s #theworldneedsmoretechno Stickers are coming up in stores soon. A big Bundle (16 Stickers) splittet into 6 Logo Stickers (Black&White) and 10 Quote Stickers (Black&White). And of course, two of them are signed from Deniz Bul himself. You like to meet Boris Brejcha for one day? Boris Brejcha reached over 1 Million Fans on Facebook and therefore he will do a small party on the 20th January 2017. You can win 1 of 5 exclusive, all inclusive travels to meet Boris. Save the 22nd November 2016! Ann Clue and Boris Brejcha´s Single EP "Acid Attack", including the monster track "Roadtrip" will be released as a Single Vinyl. Be sure you already subscribed our Newsletter to be the first one for our pre-sale which is starting very soon! Limited 500 copies. Ann Clue and Boris Brejcha are also available for a B2B set from now one. This is a very good combination and they both love to play together. Also for extended set times like 3, 4 or more hours. Boris Brejcha is coming up with his 5th album. And this one will be a very big one. Unusual for an album you will find 22 tracks on it. From dance floor killers, over to nice and smooth melodic tracks. Boris Brejcha´s album will be available on 500 limited white Vinyls (including one USB Stick) and on MP3 in every download store. She is smart, determined and also a very nice producer. FCKNG SERIOUS is really proud to announce that Ann Clue is coming up with her first solo EP called „Rumbling Conversation“. Check it out! You gonna love it. 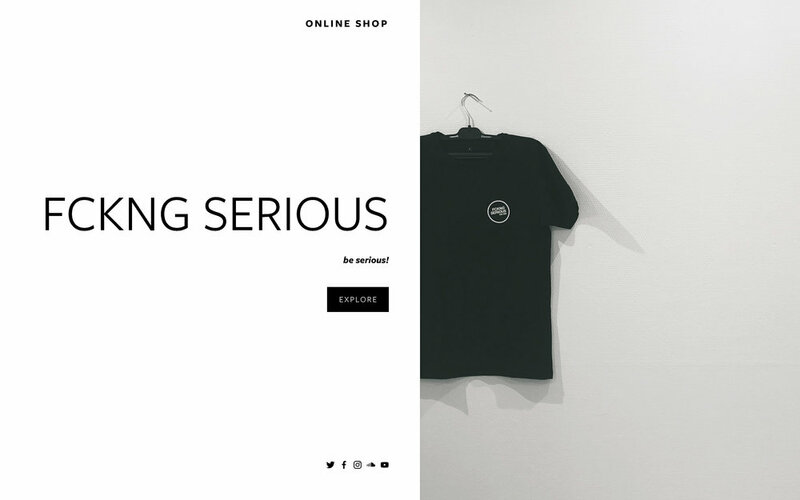 The whole FCKNG SERIOUS crew is really proud to announce that our shop is finally online. We love it and we hope you gonna like some of the products we did as well. We are really proud to announce that Stefan and Jonas aka "Theydream" gonna join our label FCKNG SERIOUS. We were following this guys since a few years and yeah... this guys are super kind and their music is just awesome. We love it. This was our very first FCKNG SERIOUS SHOW @ Audio Club, Sao Paulo. We are really happy that we have done this and working hard on it to spread it worldwide. Things are going well and we are proud to announce that the whole FCKNG SERIOUS crew will be on tour soon. For our FCKNG SERIOUS LABEL NIGHTS. Our first stop will be in Zurich (Switzerland). For the whole route check our tour list. We just arrived back in Germany and we are still impressed about our first FCKNG SERIOUS SHOW. We can´t really describe our happiness. Sure, there are still things we can improve for the next shows. But the feeling that we have done this - is just amazing. We met so many kind persons and we are so happy that we decided to organize our "Meet&Greet" before the main show. That is something which is really important for us. Talking to our fans and doing some photos. Thank you so much! Here is the second part of our "Making Of" video. We are almost done and super excited. Just one more week till our first FCKNG SERIOUS SHOW in Sa Paulo. It was so much fun recording this video and we hope you gonna smile as we did. Be serious and always remember - everybody is different but still we are all like the same. Respect each other and just have some fun. We are so happy that we finally can start with our first release. It took us a long time till we get green light for our label name. But finally we are on the road - coming with a smashing one. Release will be on August 04th. The premiere of the FCKNG SERIOUS SHOW will take place @ Audio Club, Sao Paulo. Boris Brejcha, Ann Clue, Deniz Bul and Alex Stein will be the acts for this first show. Here is a little snippet from the upcoming "FCKNG SERIOUS SHOW" making of. Fixing a lot of things at the venue in Sao Paulo. There is much more work that needs to be done but the premiere date is already fix. Save the 07th August 2015. The whole FCKNG SERIOUS Crew (Boris Brejcha, Ann Clue, Deniz Bul) will be on board as well as a special guest. Yesterday was the first day building-up our creativity into real work. Talking about the stage design and about different solutions to combine my music in a smoothly way with the visuals to get the best impact. This show will be a historical moment for me, my partners and of course all of my fans. It will be a totally different show. In a super nice and serious way. Brazil is one of the most important countries for me at all. Not only because I had the first gig in my career at Universo Paralelo there. It is more the overall picture of individual puzzle pieces which makes Brazil so charming for me. This is the reason why I will start with a special Show for 2015 in Brazil for the very first time. Together with Du Serena - my friend and business partner for many years now, the head of my Agency „Kontrol“ in Brazil - and the crew of my new Label „Fckng Serious“ we are on the way to find a good concept in order to express myself, my personality and my music, as well as to establish the artists of „Fckng Serious“ in general. The name of the Label is already well known, although we did not started yet and we want to make it special for everyone who is involved. We wanna show that "Fckng Serious" is not only my label - its a way of life! Therefore we brought up a new concept, with a breathtaking light show, new stage design and some other really nice features, to make a „FCKNG SERIOUS SHOW“ an unforgettable, unique experience for both the visitors and the artists. Brasil é um dos territórios mais importantes pra mim. Não apenas porque lá tive minha primeira apresentação como DJ, no Universo Paralello, mas sim por inúmeros fatores que juntos formam esse quebra cabeça tão charmoso e especial pra mim. É por essa razão que eu estou desenvolvendo um show novo e inédito, que será apresentado pela primeira vez no mundo aí no Brasil. Junto com Du Serena, meu amigo, agente e parceiro de negócios por muitos anos, que é a cabeça por trás da Kontrol Agency, agencia que me representa no Brasil - junto com a equipe do meu novo label Fckng Serious, estamos caminhando para encontrar o conceito perfeito para que eu possa expressar a mim, minha personalidade e minha música, e também ajudar a estabilizar alguns artistas do meu label Fckng Serious. O nome do label, já é conhecido por muitos, no entanto, ainda não começamos a lançar nele ainda. Queremos fazer algo muito especial para todos que estejam envolvidos. Queremos mostrar que „Fckng Serious" não é só um label, e sim um estilo de vida.